KATHMANDU, Oct 8: The mega cricket event Dhangadhi Premier League’s (DPL) second edition has been scheduled to start on January 19, 2017. The city-based franchise league jointly organized by the Dhangadi Cricket Academy (DCA) and Sudur Paschim Academy (SPA) was announced in a press release held at Royal Singi Hotel, Kathmandu on Sunday afternoon. 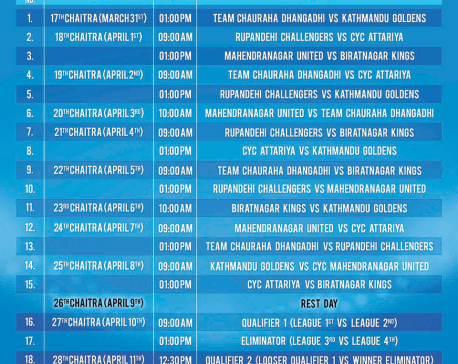 Ruslan Cricket has replaced Ghorahi Cements as the title sponsors for the cash-strapped second season of the premier league. The tournament is estimated to invest a total of NRs. 30 million in this edition. Eight city-based franchises will participate in the new edition of DPL increasing its number by two from the last edition. Fresh auctions involving all cricket players and eight franchises will be held on November. The former record-holder of biggest cash prize cricket event in Nepal has regained its position as the richest tournament by announcing a total of NRs. 4 million to be distributed among top four teams in the second edition of the marquee tournament. The winner and runner-up are set to get NRs. 2.5 million and NRs. 1 million respectively. Similarly, the third-placed team will get NRs. 300, 000 and team finishing fourth will take NRs. 200,000 home. During the tournament, a former national or international player will be awarded by the ‘Dhangadhi Cricket Samman’, similarly, a distinct person will be awarded by the ‘Arjun Khadka Smriti Samman’ for his/her contributions in cricket. A cash prize of NRs. 100,000 will be provided with each award. A ticket amount of NRs. 50 is allocated for league-phase games which will be increased to NRs. 70 during playoffs. Similarly, the ticket price for final will be NRs 100. The 20 percent of total ticket money will go to Dream Fapla whereas 40 percent will be equally distributed among eight participating franchises. The press meet podium was graced by DPL's tournament director Saurav Ojha, the president of Bijay distillery Shreehar Shamsher Jung Bahadur Rana, captain of Nepal national cricket team Paras Khadka, and the director/chairperson of Dhangadhi Cricket Academy Subash Shahi. Team Chauraha Dhangadhi led by Paras Khadka won the last tournament defeating Sharad Vesawkar led Biratnagar Kings in the final held at Seti Zone Police Ground at heart of Dhangadhi city.